For a small, prosperous country in the middle of Europe, modern Austria has a very large and complex history extending far beyond its current borders. 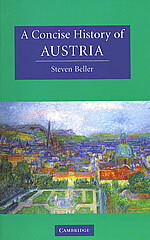 Steven Beller’s gripping and comprehensive account traces the remarkable career of Austria through its many transformations - from German borderland, to dynastic enterprise, imperial house, Central European great power, failed Alpine republic, German province, and then successful Alpine republic - building up a picture of the layers of Austrian identity and heritage and their diverse sources. It is a story full of anomalies and ironies, a case study of the other side of European history, without the easy answers of more clearly national narratives, and hence far more relevant to today’s world. The historian, Steven Beller, grew up in Great Britain as the child of an American father and an Austrian mother and is currently working as an independent scholar at the George Washington University.